George Westinghouse, Jr. (October 6, 1846 – March 12, 1914) was an American entrepreneur and engineer who invented the railway air brake and was a pioneer of the electrical industry, gaining his first patent at the age of 19 . Based in Pittsburgh, Pennsylvania for much of his career, Westinghouse was one of Thomas Edison's main rivals in the early implementation of the American electricity system. Westinghouse's electricity distribution system, based on alternating current, ultimately prevailed over Edison's insistence on direct current. 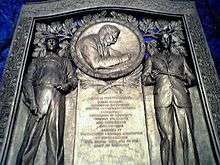 In 1911 Westinghouse received the AIEE's Edison Medal "For meritorious achievement in connection with the development of the alternating current system." George Westinghouse was born in 1846 in Central Bridge, New York, the son of Emeline (Vedder) and George Westinghouse, Sr., a machine shop owner. From his youth, he was talented at machinery and business. At the age of fifteen, as the Civil War broke out, Westinghouse enlisted in the New York National Guard and served until his parents urged him to return home. In April 1863 he persuaded his parents to allow him to re-enlist, whereupon he joined Company M of the 16th New York Cavalry and earned promotion to the rank of corporal. In December 1864 he resigned from the Army to join the Navy, serving as Acting Third Assistant Engineer on the gunboat USS Muscoota through the end of the war. After his military discharge in August 1865, he returned to his family in Schenectady and enrolled at Union College. However, he lost interest in the curriculum and dropped out in his first term there. Westinghouse was 19 years old when he created his first invention, the rotary steam engine. He also devised the Westinghouse Farm Engine. At age 21 he invented a "car replacer", a device to guide derailed railroad cars back onto the tracks, and a reversible frog, a device used with a railroad switch to guide trains onto one of two tracks. In 1867, Westinghouse met and soon married Marguerite Erskine Walker. They were married for 47 years, and had one son, George Westinghouse III, who had six children. The couple made their first home in Pittsburgh, Pennsylvania. 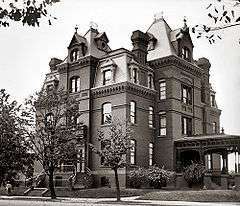 They later acquired houses in Lenox, Massachusetts, where they summered, and in Washington, District of Columbia. In 1869, at age 22, Westinghouse invented a railroad braking system using compressed air. 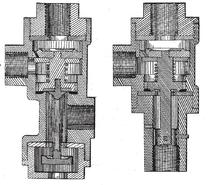 The Westinghouse system used a compressor on the locomotive, a reservoir and a special valve on each car, and a single pipe running the length of the train (with flexible connections) which both refilled the reservoirs and controlled the brakes, allowing the engineer to apply and release the brakes simultaneously on all cars. It is a failsafe system, in that any rupture or disconnection in the train pipe will apply the brakes throughout the train. It was patented by Westinghouse on October 28, 1873. The Westinghouse Air Brake Company (WABCO) was subsequently organized to manufacture and sell Westinghouse's invention. It was in time nearly universally adopted by railways. Modern trains use brakes in various forms based on this design. The same conceptual design of fail-safe air brake is also found on heavy trucks. Westinghouse Electric Company 1888 catalog advertising their "Alternating System"
In 1879, Thomas Edison invented an improved incandescent light bulb, and realized the need for an electrical distribution system to provide power for lighting. On September 4, 1882, Edison switched on the world's first electric power distribution system, providing 110 volts direct current (DC) to 59 customers in lower Manhattan, around his Pearl Street Station. The main drawback with Edison's low-voltage DC power network was its short transmission range, with centralized plants only able to supply customers within a mile of each plant. Westinghouse's interests in gas distribution and telephone switching led him to become interested in the field of electrical power distribution. In 1884 he started developing his own DC lighting system and hired physicist William Stanley to work on it. Westinghouse became aware of the new European AC systems in 1885 when he read about them in the UK technical journal Engineering. An AC power system allowed voltages to be "stepped up" by a transformer for distribution long distances without the severe power losses suffered by DC systems, and then "stepped down" by a transformer for consumer use. With AC's potential to achieve greater economies of scale with large centralized power plants, and its ability to supply electricity long distance in cities with more disperse populations, Westinghouse saw a way to build a truly competitive system instead of simply building another barely competitive DC lighting system using patents just different enough to get around the Edison patents. The Edison DC system of centralized DC plants with short transmission range also meant that there was a patchwork of un-supplied customers between Edison's plants that Westinghouse could easily supply with AC power. In 1885 Westinghouse imported a number of Gaulard-Gibbs transformers (developed by Lucien Gaulard of France and John D. Gibbs of England, and demonstrated in London in 1881) and a Siemens AC generator, to begin experimenting with AC networks in Pittsburgh. AC transformers were not new, but the Gaulard-Gibbs design was one of the first that could handle high power and be readily manufactured. Stanley, assisted by engineers Albert Schmid and Oliver B. Shallenberger developed the Gaulard-Gibbs transformer design into the first practical transformer used in an AC system. In 1886, Westinghouse and Stanley installed the first multiple-voltage AC power system in Great Barrington, Massachusetts. 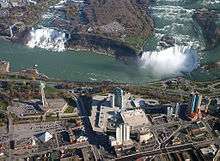 The network was driven by a hydroelectric generator that produced 500 volts AC. The voltage was stepped up to 3,000 volts for transmission, and then stepped back down to 100 volts to drive electric lights. That same year, Westinghouse formed the "Westinghouse Electric & Manufacturing Company"; in 1889 he renamed it as "Westinghouse Electric Corporation". The Westinghouse company installed 30 more AC-lighting systems within a year and by the end of 1887 it had 68 alternating current power stations to Edison's 121 DC based stations. The expansion of Westinghouse's AC power distribution system led him into a bitter confrontation with Edison and his DC power system in a feud that became known as the "War of Currents". Edison mentioned to colleagues at the end of 1886 that Westinghouse would "kill a customer within six months" with his new AC system and first spoke out (privately) in a late 1887 letter to a New York State committee trying to determine a new, more humane system of execution to replace hanging, say the best method would be to wire the prisoner to a Westinghouse AC generator. In February 1888 Edison began a public media campaign claiming that high voltage AC systems were inherently dangerous. Westinghouse responded that the risks could be managed and were outweighed by the benefits. Edison tried to have legislation enacted in several states to limit power transmission voltages to 800 volts, but failed. Westinghouse also had to deal with an AC rival, the Thomson-Houston Electric Company. They had built 22 power stations by the end of 1887 and by 1889 had bought out a third AC competitor, the Brush Electric Company. Thomson-Houston was expanding their business while trying to avoid patent conflicts with Westinghouse, arranging deals such as coming to agreements over lighting company territory, paying a royalty to use the Stanley transformer patent, and allowing Westinghouse to use their Sawyer-Man incandescent bulb patent. After a young New York City boy was killed from accidentally touching a fallen telegraph wire that had been energized with alternating current, an electrical consultant named Harold P. Brown sent a June 5, 1888 letter to the editor of the New York Evening Post. The letter claimed that alternating current was inherently dangerous and asked why the "public must submit to constant danger from sudden death" just so utilities could use a cheaper AC system. Within a few days, Brown was lobbying in the newspapers for severe regulations on AC power. Within two months he would publicly electrocute a dog with AC at Columbia College to prove how dangerous it was. Westinghouse pointed out, in letters to various newspapers, the number of fires caused by DC equipment and that Brown was obviously in the employ of Edison, something Brown denied. Brown, after becoming a consultant to the New York board in charge of finding a new method of executing condemned prisoners, went on to be instrumental in making sure that AC would be used in the newly developed electric chair. In August 1889, the New York Sun published letters stolen from Brown's office that seemed to show that Brown was receiving directions from, and being paid by, the Edison company and the Thomson-Houston company. Thomson-Houston also worked with Brown to secretly acquire 3 secondhand Westinghouse AC generators for prisons to use in their executions. In August 1890, a convict named William Kemmler became the first man to be executed by electrocution. Westinghouse hired the best lawyer of the day to defend Kemmler, and the lawyer condemned electrocution as a form of "cruel and unusual punishment", not allowable under the US Constitution. The War of Currents would end with financiers, such as J. P. Morgan, pushing Edison Electric towards AC and pushing out Thomas Edison. 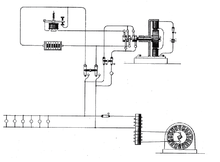 The Edison Machine Works started pursuing AC development in 1890. By 1892, Thomas Edison was no longer in control of his own company. It was merged with the Thomson-Houston Electric Company into General Electric, a conglomerate now armed with all of Thomson-Houston's AC patents. During this period Westinghouse continued to pour money and engineering resources into the goal of building a completely integrated AC system. To gain control of the Sawyer-Man lamp patents he bought Consolidated Electric Light in 1888. In April 1888 Westinghouse engineer Oliver B. Shallenberger developed an induction meter that used a rotating magnetic field for measuring alternating current. The same basic meter technology remains in use today in the early 21st century. That same year, inventor Nikola Tesla demonstrated a polyphase brushless AC induction motor, also based on a rotating magnetic field. An AC electric motor was one of the final elements an AC system needed to compete with DC systems. In July 1888, George Westinghouse licensed Nikola Tesla's American patents for the induction motor and transformer designs. Westinghouse also purchased an American patent option on a possible prior design for an induction motor from the Italian physicist and electrical engineer Galileo Ferraris. He wanted to avoid the rather substantial amount of money being asked to secure the Tesla license, but Westinghouse concluded that it was too risky not to obtain what may have been an earlier patent by Tesla. The acquisition of a feasible AC motor gave Westinghouse a key patent in building a completely integrated AC system, but the financial strain of buying up patents and hiring the engineers needed to build it meant development of Tesla's motor had to be put on hold for a while. In 1891 Westinghouse built a hydroelectric AC power plant, the Ames Hydroelectric Generating Plant. The plant supplied power to the Gold King Mine 3.5 miles away. 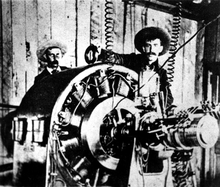 This was the first successful demonstration of long-distance transmission of industrial-grade alternating current power and used two 100-hp Westinghouse alternators, one working as a generator producing 3000 volt, 133 Hertz, single-phase AC, and the other used as an AC motor. At the beginning of 1893 Westinghouse engineer Benjamin Lamme had made great progress developing an efficient version of Tesla's induction motor and Westinghouse Electric started branding their complete polyphase phase AC system as the "Tesla Polyphase System", announcing Tesla's patents gave them patent priority over other AC systems and their intentions to sue patent infringes. In 1893, George Westinghouse won the bid to light the 1893 World's Columbian Exposition in Chicago with alternating current, beating a General Electric bid by one million dollars. This World's Fair devoted a building to electrical exhibits. It was a key event in the history of AC power, as Westinghouse demonstrated the safety, reliability, and efficiency of a fully integrated alternating current system to the American public. Westinghouses demonstration that they could build a complete AC system at the Colombian Exposition was instrumental in them getting the contract for building a two phase AC generating system, the Adams Power Plant, at Niagara Falls in 1895. In order to keep the other big electric company in play for future projects, the contract to build the three-phase AC distribution system was awarded to General Electric. The early to mid 1890s saw General Electric, backed by financier J. P. Morgan, involved in costly take over attempts and patent battles with Westinghouse Electric. A patent sharing agreement was finally signed between the two companies in 1896. In 1889, Westinghouse purchased several mining claims in the Patagonia Mountains of southeastern Arizona and formed the Duquesne Mining & Reduction Company. A year later he founded what is now the ghost town of Duquesne to use as his company headquarters. He lived in a large Victorian frame house, which still stands, but in disrepair. Duquesne grew to over a 1,000 residents and the mine reached its peak production in the mid-1910s. One of his first inventions had been a rotary steam engine, but it had proven impractical. The British engineer Charles Algernon Parsons began experimenting with steam turbines in 1884, beginning with a 10-horsepower (7.5 kW) . Westinghouse bought rights to the Parsons turbine in 1885, and improved the Parsons technology and increased its scale. In 1898 Westinghouse demonstrated a 300 kilowatt unit, replacing reciprocating engines in his air-brake factory. The next year he installed a 1.5 megawatt, 1,200 rpm unit for the Hartford Electric Light Company. Westinghouse then developed steam turbines for maritime propulsion. Large turbines were most efficient at about 3,000 rpm, while an efficient propeller operated at about 100 rpm. That required reduction gearing, but building reduction gearing that could operate at high rpm and at high power was difficult, since a slight misalignment would shake the power train to pieces. Westinghouse and his engineers devised an automatic alignment system that made turbine power practical for large vessels. Westinghouse remained productive and inventive almost all his life. Like Edison, he had a practical and experimental streak. At one time, Westinghouse began to work on heat pumps that could provide heating and cooling, and believed that he might be able to extract enough power in the process for the system to run itself. Westinghouse was after a perpetual motion machine, and the British physicist Lord Kelvin, one of Westinghouse's correspondents, told him that he would be violating the laws of thermodynamics. Westinghouse replied that might be the case, but it made no difference. If he couldn't build a perpetual-motion machine, he would still have a heat pump system that he could patent and sell. With the introduction of the automobile after the turn of the century, Westinghouse went back to earlier inventions and devised a compressed air shock absorber for automobile suspensions. George Westinghouse died on March 12, 1914, in New York City at age 67. He was initially interred in Woodlawn Cemetery, Bronx, NY then removed on December 14, 1915. As a Civil War veteran, he was buried in Arlington National Cemetery, along with his wife Marguerite, who survived him by three months. She had also been initially interred in Woodlawn and removed and reinterred at the same time as George. A six-day workweek was the rule when George Westinghouse inaugurated the first Saturday half holiday in his Pittsburgh factory in 1881. The Westinghouse Memorial in Schenley Park. The George Westinghouse, Jr., Birthplace and Boyhood Home in Central Bridge, New York was listed on the National Register of Historic Places in 1986. ↑ "George Westinghouse". IEEE Global History Network. IEEE. Retrieved 22 July 2011. ↑ Register of Commissioned Officers of the United States Navy. 1865. pg. 209. 1 2 George Westinghouse Timeline Archived October 21, 2014, at the Wayback Machine. ↑ He would later patent the device. It was issued as U.S. Patent 76,365 in April 1868, when he was 22. It would be reissued as U.S. Patent RE3,584 in August 1869. ↑ Patent US144006 - IMPROVEMENT IN STEAM AND AIR BRAKES - Google Patents. Google.com. Retrieved on 2013-11-02. ↑ "Steam Hammer, Westinghouse Works, 1904". World Digital Library. May 1904. Retrieved 2013-07-28. ↑ John and Bette Bosma (April 2006). "Southwest Arizona Ghost Towns Harshaw, Mowry, Washington Camp, Duquesne, Lochiel" (PDF). Retrieved 2015-01-10. ↑ Sherman, James E. & Barbara H. (1969). Ghost Towns of Arizona. University of Oklahoma. ISBN 0806108436. Wikimedia Commons has media related to George Westinghouse. Wikisource has the text of a 1922 Encyclopædia Britannica article about George Westinghouse.